Awareness of PTSD is building, and with it support for war veterans. With just a little thought, it’s not all that difficult to imagine what it must be like for soldiers who come home from war bearing invisible scars. They’ve been through some of the most intense experiences our world has to offer, and endured what nobody should have to endure. These battle-hardened individuals have faced death, terror, pain, horror, and suffering, and the memories remain with them. Few, however, are aware of just how many people struggle with PTSD who’ve never left their homes. You see, PTSD is not a combat only disorder. This disorder can affect anyone who has experienced or witnessed a traumatic event. While war certainly qualifies as traumatic, it is not the only trauma a person can go through. Domestic violence is the MOST prevalent factor in individuals developing PTSD. Children are especially at risk, with approximately 50% of children who experience abuse in their homes later developing PTSD symptoms. 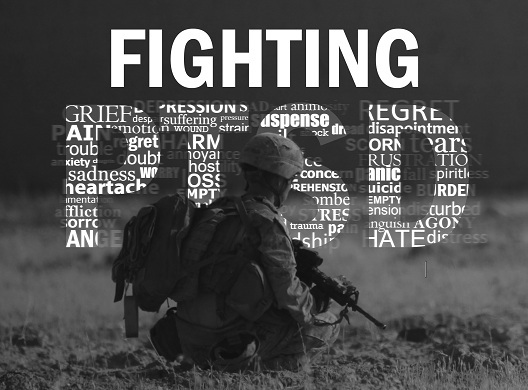 The problem with PTSD that has resulted from abuse as opposed to PTSD that has resulted from combat is that it isn’t as easy for people to understand. A combat soldier triggered by Independence Day fireworks displays is easy for people to understand. Getting triggered by a pile of dirty dishes in the sink…. not so easy to understand. A “trigger”, as it relates to PTSD, is any stimulation or sensory input that reminds an individual of the trauma they experienced. Fireworks sound a lot like gun shots and mortar shells, so hearing them can remind a soldier of their time spent on the battle field. This “triggers” their fight/flight response as the brain relates the sound to danger. It also triggers the resurfacing of the memory in which the soldier really was in danger. Sometimes this triggered memory hits with such intensity that the soldier then experiences a “flashback” and completely loses track of where they are. They feel like they are THERE. Back on the battlefield. Fighting down that reaction, reconnecting with reality, convincing yourself that you are in no immediate danger and there is no need for your body to be reacting so viscerally can be exhausting. For those who’s traumas are related to domestic violence, the triggers won’t be as obvious as fireworks. And they won’t be the same for everyone. The triggers are as unique as were the individual traumas experienced. For me… washing dishes is a trigger, because I was washing dishes when my husband scarred me for life. I remember standing in front of the sink with a dull ache in my lower back and ankles. I was eight months pregnant, and I’d been standing there for over an hour already, because we’d allowed our dishes to keep piling up until we couldn’t put off doing them any more. My hands were dipped in the warm, sudsy water when I heard my husband scream in anger and frustration from the bathroom. I immediately tensed, my fight/flight response already kicking in as I knew what that sound meant. A fight. He shouted out from the bathroom that he’d stepped on my razor and that he’d told me not to keep it in the shower. Without even thinking, I responded on the defensive, answering that the cap was on the razor so there was no reason to be making such a fuss about it. I heard the resultant tantrum, as he punched the wall, threw the razor, and turned off the shower. Then silence, and within moments he was standing next to me. Sweaty, wet, towel wrapped around his waist, and a crazed angry look in his eyes that I refused to meet. He was towering over me from behind, glaring at me, and breathing heavily but saying nothing. I opted to ignore him and continued washing the dishes, but my heart was pounding. I was terrified. I knew, at the very least, I was going to be hit. That much was unavoidable. It didn’t matter what I said or did at that point. Once the beast was unleashed, it wouldn’t stop until it inflicted some form of pain. Even more agonizing though was the waiting. Why didn’t he just get it over with? After what felt like an eternity, but was probably in reality only a few minutes, his patience with me reached it’s end and he snarled at me, demanding an apology. I don’t even remember the exact words we exchanged at that point. I just remember that I’d become defiant and strangely, outwardly “calm” despite my racing heart. I remember telling him off. I remember telling him there was no reason for me to apologize and that he was being childish. Some additional words were passed between us that I don’t remember, but I distinctly remember refusing to meet his gaze and continuing to wash the dishes while he hovered directly behind me. Then, something I said finally tipped him off his edge, and the violence ensued. But while I’d been hit before, this time was different. He shoved me into the sink. Hit me in the side of the head. Grabbed my neck from behind and choked me, and when I attempted to kick out his knee cap to make him let go, he tossed me to the side and grabbed a butcher’s knife off the counter. My defiance immediately dissipated into a heap of blubbering abject terror. He had me cornered – the only place I could go without making an attempt to run past him was further into the kitchen, trapped up against the wall. He said something about cutting my stomach open and I melted onto the floor. I lost control of my bladder and found myself in a puddle of my own urine. My voice changed as I broke down into uncontrollable sobs. I curled up in the corner into the fetal position, knowing there was no escape and that if this man chose it I was going to die. Seeing me so broken apparently achieved whatever goal he’d had in mind, and after eyeing me maniacally for a few moments, his demeanor changed. He put the knife back on the counter and started apologizing profusely, but when he tried to approach me, tried to touch me, I swatted his hands away screaming as if he were following through with cutting me open. I didn’t come around until my fear had run it’s course and worked it’s way through my entire body, wracking me with painful sobs, silencing my voice, and leaving me weak and frail and exhausted. That moment changed everything, and my relationship didn’t last much longer before I found a way to flee. Now it’s been almost six years… but I relive that moment every time I stand in front of a sink full of dirty dishes and place my hands in that warm, sudsy water… When I manage to keep the sink clear, cleaning dishes the moment I dirty them, I can push it to the back of my mind and only feel a little tense for just a moment. But once a day’s worth of dishes have piled in the sink, my mental blocks kick in and I become avoidant. The pile gets bigger and bigger until I can no longer put it off… and then I roll up my sleeves and face the battlefield. I chose you for this award because when I read your posts you make me feel brave for still being alive and I feel like I’m not the only one having a hard day due to triggers. Thank you. Thank you! I’d be honored to accept the nomination, and I’m glad my post has helped you to feel braver and stronger in facing your personal battlefields.